The first decade of the 21st century witnessed a slowdown in the rise of global surface atmospheric temperatures, referred to as the global warming hiatus. During this time, the tropical Pacific Ocean absorbed more heat from the atmosphere than in previous decades, associated with unusually strong trade winds and a cold phase of the Pacific Decadal Oscillation. However, there is no evidence that the tropical Pacific heat content increased during this time. Where did the excess heat go? Coincidentally, observations indicated that the upper 700 m of the Indian Ocean gained heat at a greater rate than in previous decades, comparable to the enhanced heat uptake in the Pacific. Modeling studies have suggested that there was significant heat transfer from the Pacific to the Indian Ocean via the Indonesian Seas during the global warming hiatus. The Indonesian Throughflow is a permanent feature of the ocean general circulation and is known to vary on seasonal time scales, on interannual time scales associated with El Niño and the Southern Oscillation, and on decadal time scales. Observations indicate that for the first decade of the 21st century, flow from the Pacific to the Indian Ocean in the upper few hundred meters was strengthened by the intensified Pacific trade winds, consistent with the idea of enhanced heat transport from the Pacific to the Indian Ocean. What has been missing until recently is a quantitative assessment of the heat balance in the Southern Indian Ocean to determine whether the presumed heat flux into the basin from the Indonesian Throughflow balances the observed net gain in heat content when taking into account other sources and sinks of heat (such as heat fluxes across the air-sea interface). To address this problem, Zhang et al. examined the heat balance in the upper 700 m of the Indian Ocean using a heat-conserving ocean reanalysis product, namely, the ECCO v4.3 (Estimating the Circulation and Climate of the Ocean version 4 release 3). This reanalysis is an optimal solution of the MIT General Circulation Model into which several hundred million satellite and in situ ocean observations have been assimilated over the period 1992–2015. The 24-year period of this reanalysis allowed for a comparison of conditions prior to and during the global warming hiatus to determine what factors were responsible for the heat content increase in the Indian Ocean. The analysis confirmed that the largest change in heat input to the Indian Ocean during that hiatus was through the Indonesian Seas. 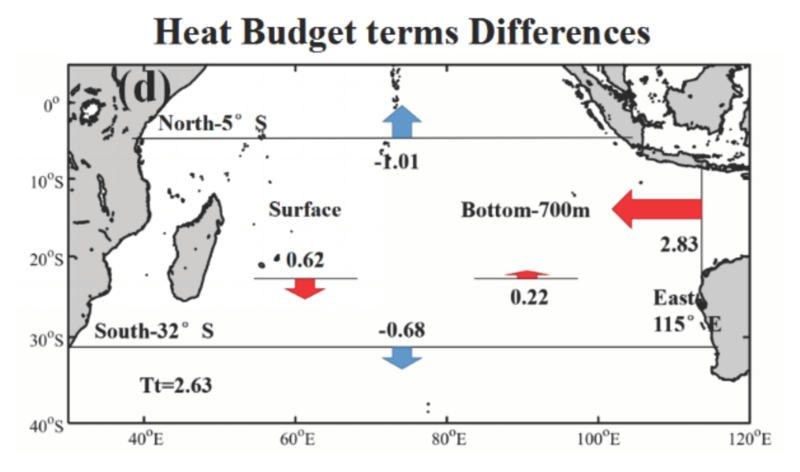 This heat gain was augmented by a secondary anomalous gain in heat across the air-sea interface because of reduced latent heating linked to a reduction in Southern Indian Ocean trade winds. The results emphasize the importance of sustaining long-term observation systems in the Indo-Pacific Ocean to better describe regional-scale climate variability that is globally relevant and to constrain ocean reanalysis products that can be used to quantitatively diagnose that variability.